The trek consists of trails dug out of rock faces and wooden bridges, cut through deep dark folds in the mountain, glaciers and icy slopes, and over snow fields. Along the way there are white Rhododendrons and expanse of green meadows. There are different trails that access the Rupin Pass. One of them starts at the sleepy village of Gosangu which is the last road head of Himachal Pradesh. Generally, trekkers and adventurers travel to Gosangu by road from Shimla via Rohru. 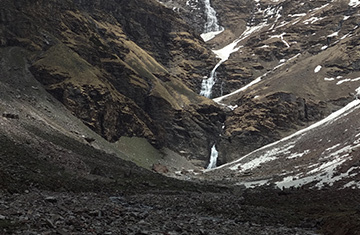 The alternate route to Rupin Pass starts from Naitwar, which is accessible from Dehradhun via Dhaula. From either of the two road heads, the first camp is Jhaka, the hanging village and the last stop for replenishing stocks and a look at the civilization. Traveling the Rupin Pass is a moderate - difficult level of climbing. The trails follow the Rupin river all the way to the top (Upper waterfall camp). Day 1: Arrival at Shimla. Departure to Sangla. (225 km , 2700 mtrs). Day 2: Jiskun (7,700 ft) to Jhaka ( 8,700 ft , 6-7kms trek). Day 3: Jhaka (8,700 ft) to Dhanderas Thatch (11,550 ft, 9-10 kms trek). Day 4: Dhanderas Thatch (11,550 ft) to Upper Waterfall (13,150 ft ,kms trek, 4-5 kms trek). Day 5: Upper Waterfall (13,150 ft) to Ruppin Pass (15,250 ft) and to Ronti Gad (13,150 ft 8-9 kms). Day 6: Ronti Gad ( 13,150 ft) to Sangla (8,600 ft ,10-11 kms trek) Departure to Shimla. Camps (Sharing Camp , Home Stay). Qualified and experienced trek Leader, Guide and Support staff to help trekkers. All meals during the trek (Breakfast, Packed lunch and dinner, only veg). Trek equipment’s: Tent, Mattress, Sleeping Bag, Dining and Kitchen Tent, Toilet Tent, cooking. utensils and Crampons(if required). Guide Allowances, Food and Stay. Potters (Potters will be only for trekking equipments). Potters Allowances, Food and Stay. Kitchen Staff Allowances, Food and Stay. Cook Allowances, Food and Stay. Extra Meals like lunch during the journey by cab and stay at hotels, lunch will be provided only during the trek. Personal Expenses like: Water Bottles, Laundry, Phone Calls etc. If the Number of days increases due to any reason road block, Strikes, Govt. Ban etc extra charges Rs 2000/- will be charged per day. There will be no provision of stay at last day of the trek (Sangla). 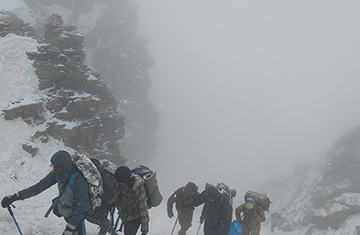 “The Himalayan Nomadian Tribe” has a team of Professional Trekkers and Local peoples. Day temperature in the sun is pleasant and windy but nights are cold. The temperature at night with rain and snow can really go down; sometimes below zero so you must be well prepared. 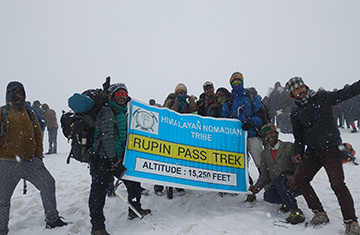 Services provided during the trek accommodation in 2 and tents (high altitude alpine tents of good quality), heavy foam pad matters, sleeping bags, breakfast/tea, all meals, services of experienced guide and cook, camping and technical equipment, utensils, adequate medical kit, transportation during the trek. A good body fitness is necessary to enjoy the high altitude and trek to the fullest. Following can help you prepare for the trek. Jogging 5kms in half an hour for stamina. Planks and squats for muscle strength.